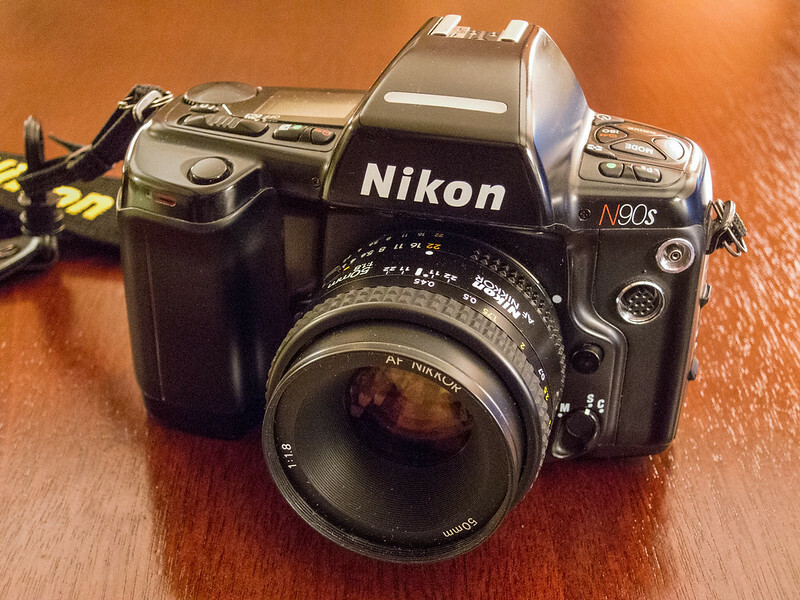 A sure sign that we live in remarkable times: I bought this Nikon N90s body, which retailed new for anywhere between $700 and $1000, for just $27. Twenty-seven bucks for this professional-caliber 35mm SLR with more features than I will ever be able to use. And I tried: I shot three rolls of film before writing this review, but barely scratched the surface of what this camera can do. Nikon made the N90s (F90X outside of North America) from 1994 to 2001. It superseded the earlier, very similar N90/F90, which was made from 1992 to 1994. Nikon aimed these cameras at advanced amateurs and as alternate bodies for pro photographers who otherwise shot the F4. Don’t let the plastic body fool you: this metal-framed camera is built for rugged use. It doesn’t take much Internet searching to find stories of N90s’s that kept shooting after harrowing treatment. This camera has so much going on it would take me five paragraphs to describe it all. But a few key facts: its shutter operates from 30 seconds down to a super-fast 1/8000 sec., and it takes film from ISO 6 to 6,400. It offers four exposure modes (program, shutter-priority, aperture-priority, and manual) and three metering modes (spot, center-weighted, and 3D matrix). You get all of those exposure and metering modes when you use AF-D Nikkor lenses; you lose some of those modes with AF-G and plain AF Nikkor lenses and more of them with AI Nikkor lenses. If you’d like to know more, check out the details at camera-wiki.org. The N90s was designed before the now-ubiquitous mode dial was invented. To select modes and settings, you have to press various buttons and spin the dial that’s to the right of the LCD panel. It works well enough, but it’s tricky to learn. Not obvious: how to rewind the film. Simultaneously press both buttons that have a film canister on them. Also, you can reset the camera to its defaults by pressing both green-dot buttons simultaneously. Some users recommend doing this with each fresh roll of film, so you don’t end up with some wacky setting from the last roll messing up your shots. The camera came with a couple rolls each of expired ISO 400 Fuji and Kodak color film. I was so eager to shoot this camera that I loaded a roll of the Fuji right away. 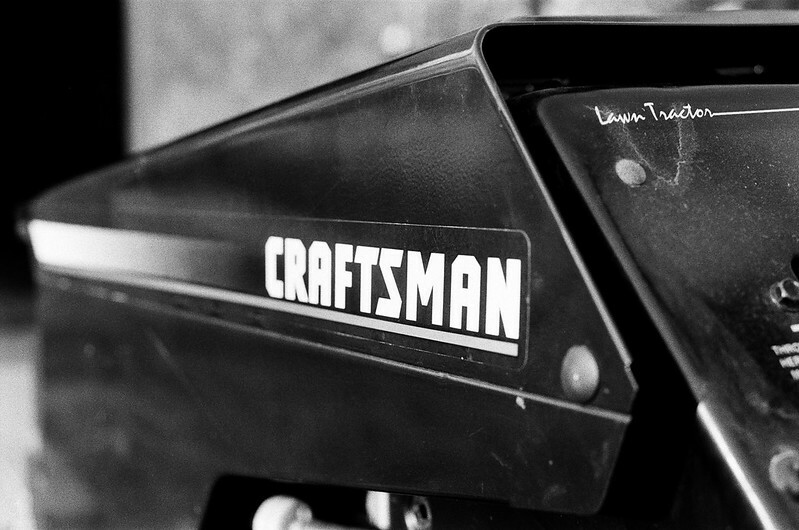 Loading is simple: drop in the cartridge, draw the film leader to the red line, close the back. I also dropped in the four AA batteries the camera needs to do anything and mounted a 28-80 mm f/3.3-5.6G AF Nikkor lens that I already owned. It was after dark, so I just shot things around the house on my tripod. That lens lacks an aperture ring, so I could shoot only in Program mode. 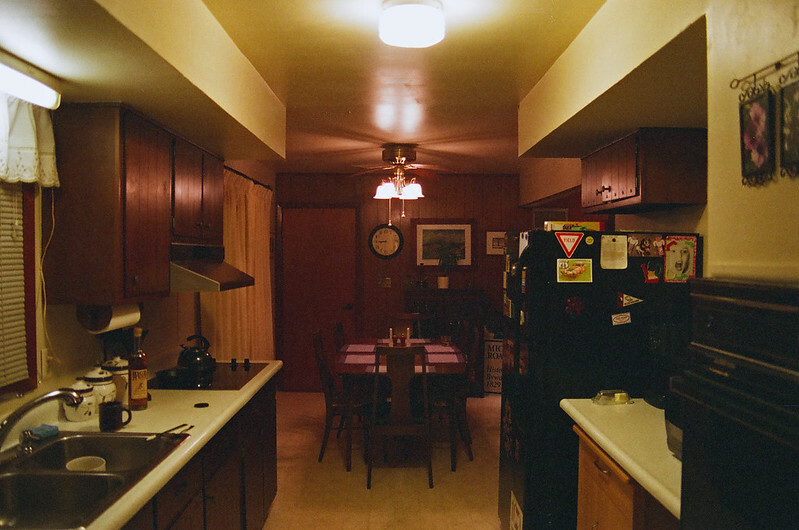 Here’s my kitchen and dining room. 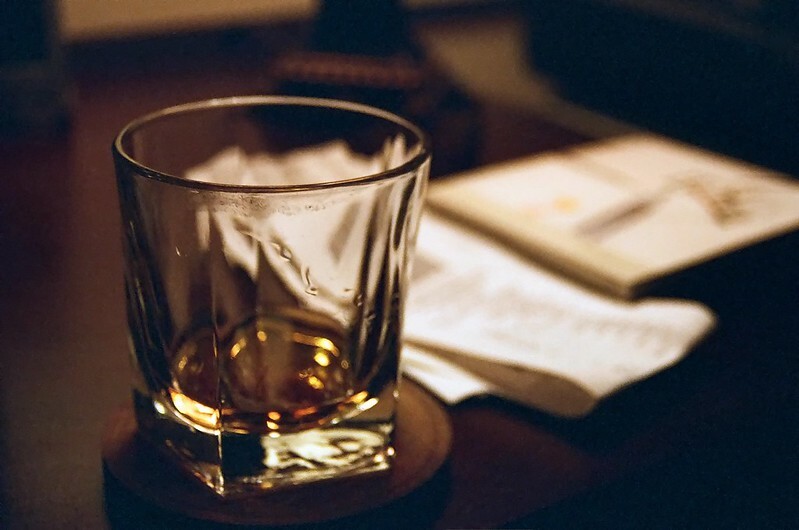 And here’s a glass of the rye whiskey I was sipping that night, along with some miscellaneous desk clutter. The camera handled flawlessly. 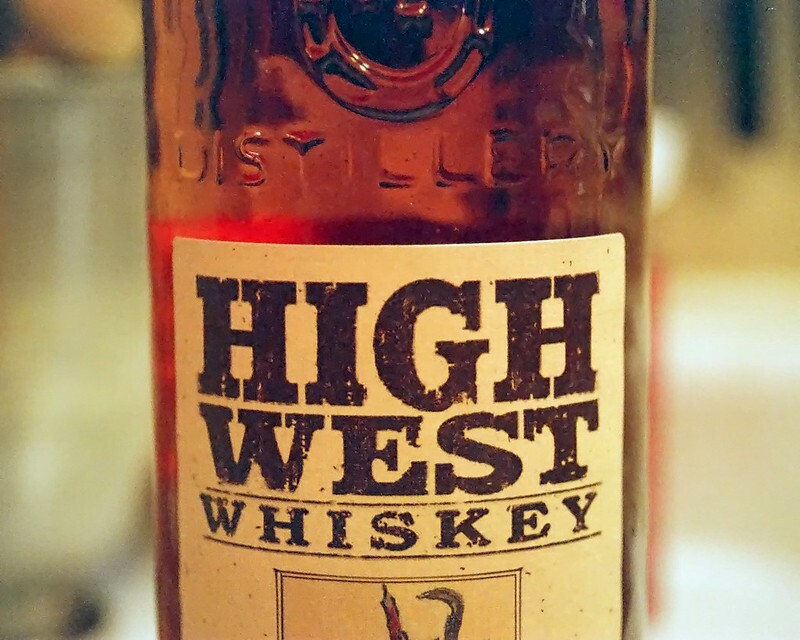 This is what I was sipping: High West Double Rye. 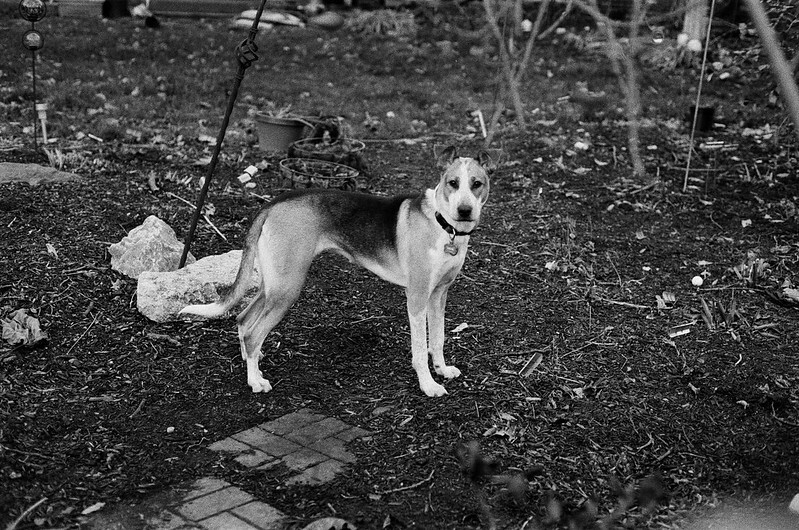 All of these shots had a lot of noise and grain, which I blame on the expired film. I boosted levels in Photoshop but then used this new-to-me software called LUCiD that offers a bunch of quick fixes to challenged images. It smoothed out that noise pretty well. Oh my gosh, was that fun. I wanted to go deeper. 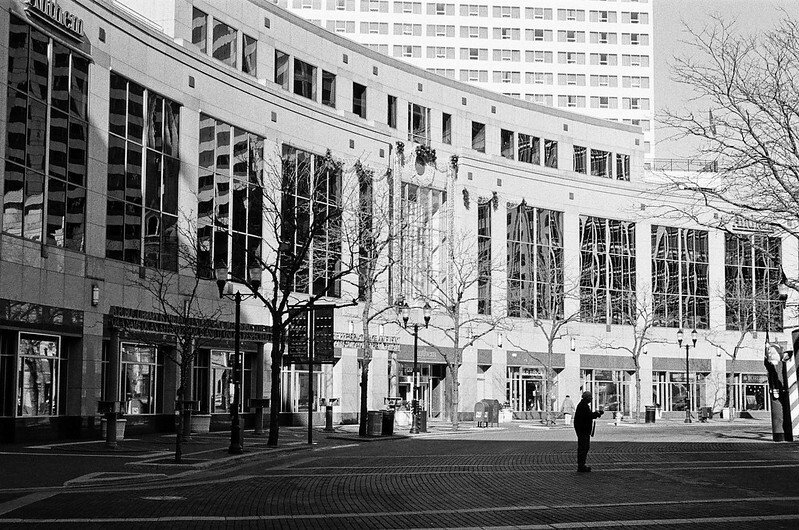 So I bought a 50mm f/1.8 AF Nikkor lens off eBay and ran a roll of fresh Eastman Double-X 5222 through the N90s. Meet my lawn tractor’s port flank. The tractor is dark green in real life, but that Double-X deepens dark colors. I think my tractor would look awesome in all black. I learned too late that if I had bought the “D” version of this lens, I could have taken advantage of the N90s’s 3D matrix metering. But even without it, this camera delivered flawless exposures. And that wonderful Double-X film delivered its signature contrast. 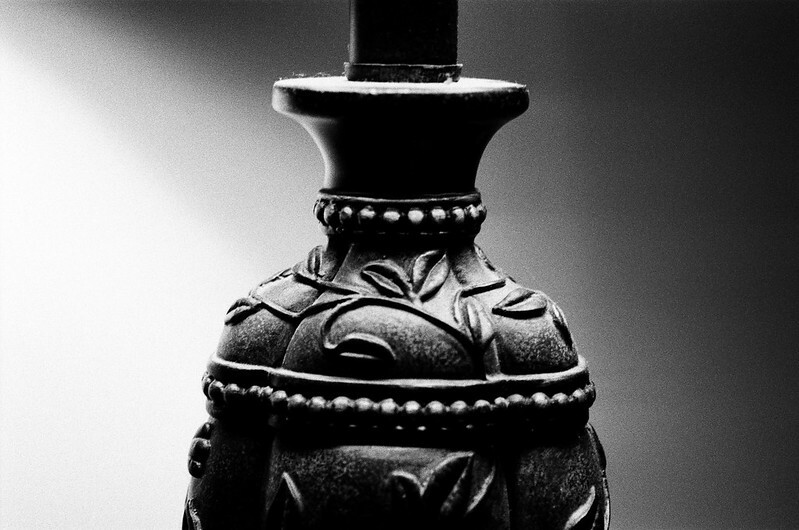 This is a detail of the lamp on the desk where I write this blog. This is my next-door neighbor’s new dog. Good grief, does he bark. And bark and bark and bark. Margaret and I traveled to Woodstock, Illinois, in a blinding snowstorm to see her older sister get married. 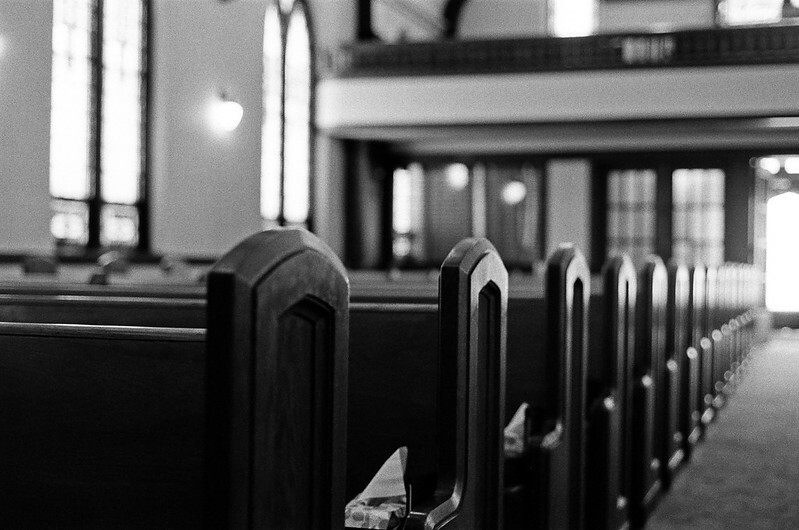 I brought the N90s, that 50mm lens, and some Arista Premium 400 to document the day as best I could. 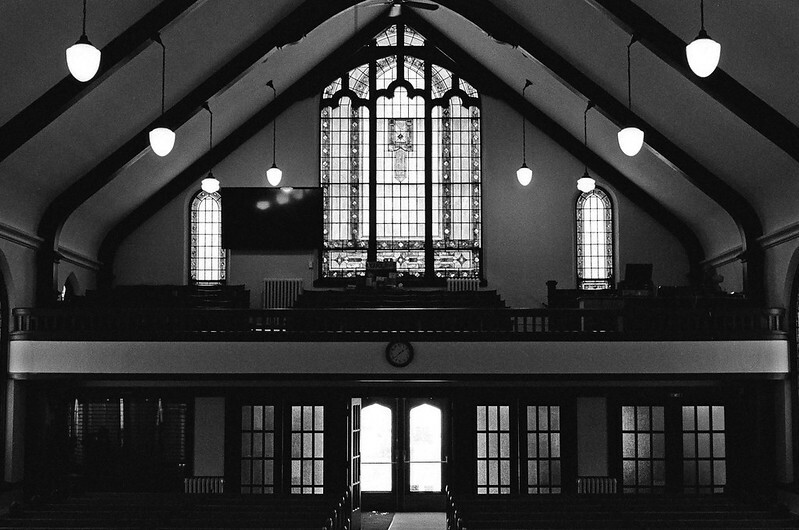 This is the interior of the First United Methodist Church. Some people find the N90s’s autofocus system to be slow. My demands of autofocus are usually light; the N90s focused fast enough for me. And it absolutely nailed exposure every time. I finished the roll Downtown. We had an unusually warm December, just right for a late-year photo walk. 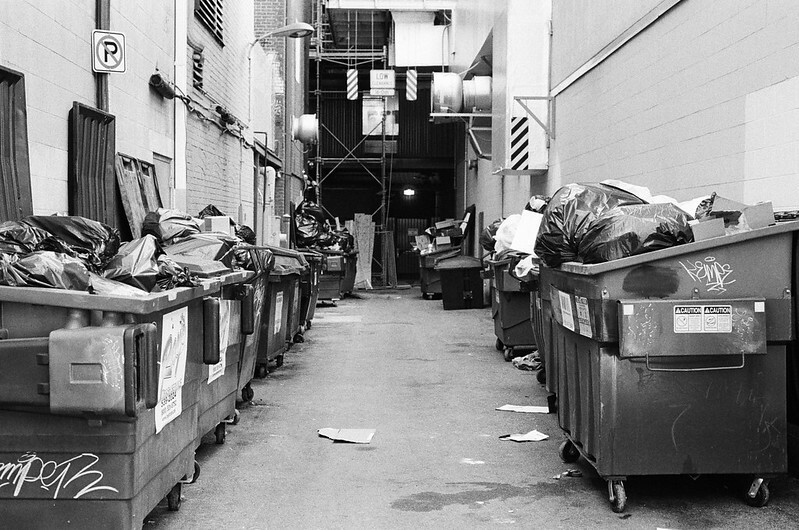 Here’s a trashy alleyway. This is the Anthem Insurance building on Monument Circle. Long before I moved to Indianapolis, this building was a windowless JCPenney store. 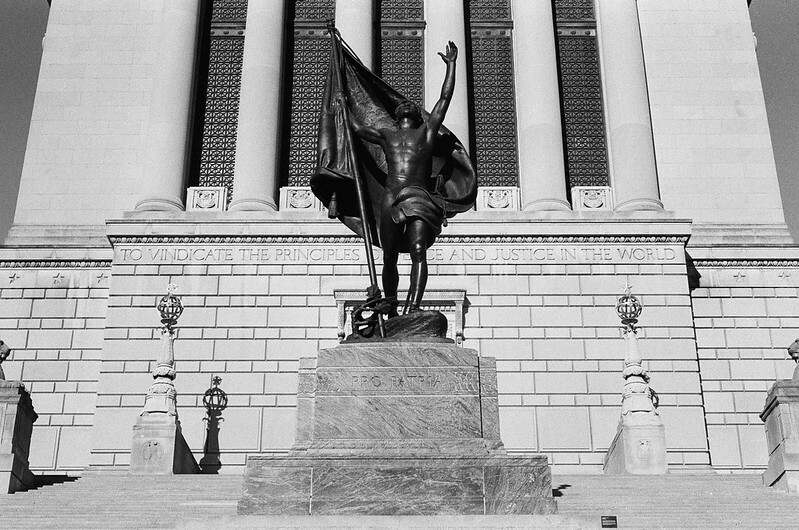 Finally, here’s a scene from the Indiana War Memorial that shows off that 50mm f/1.8 lens’s sharpness. To see more photos, check out my Nikon N90s gallery. Even though I’m much more a manual-focus kind of guy, there are times when autofocus shooting is the way to go. 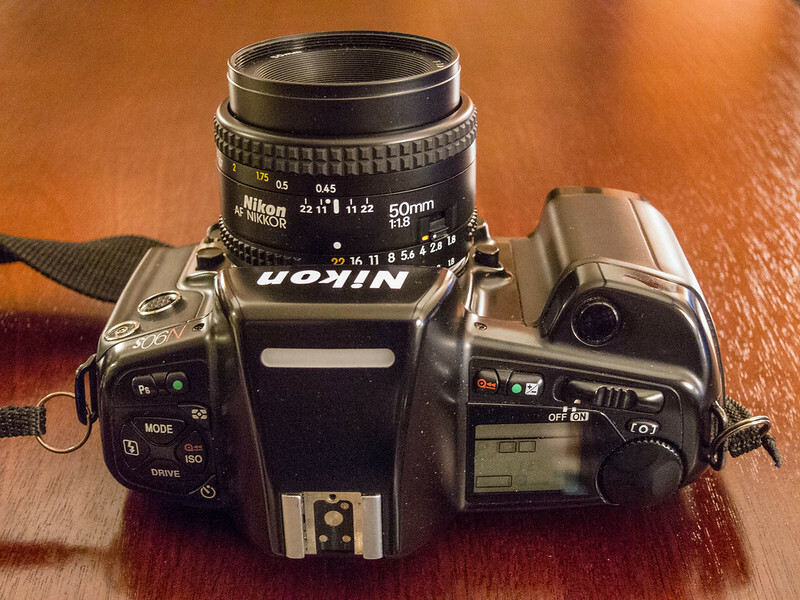 I’ve tried before with Nikon’s N60 and the N65, but found these consumer cameras’ limitations to be frustrating. In contrast, the N90s handled absolutely everything I threw at it and returned flawless exposures every time. The N90s is a keeper. Do you like old film cameras? Then check out all my reviews! My gosh. Such great images — for any price, but stunning for $27. Nicely done, Jim. Thanks Heather! My gosh, but do I love a bargain. Gosh thanks! I ought to do a post about how my skills have improved over the years. Because when I started doing this, I was terrible at it. A great write up and some fantastic photos. I’ve had mine for many years now and have put hundreds of rolls of film through it in that time. It’s been bashed and battered, drenched in the rain, and even smoke bombed once when I got caught up in something that got a little bit out of hand. It’s a great ‘action’ camera, and one feature I use all the time is the ability to instantly switch back and forth between auto and manual focus. One thing that always surprises me is the batteries. Even though they have to drive the autofocus as well as all the electronics, they seem to last for ages, I’ve never really tracked it, but I based on my own experience I would guess that a good set of batteries will easily see you through 40 rolls of film. Thanks so much Gerald! I can see why you’ve stuck with your F90X — it’s a wonderful machine, just so capable. I shot my family’s Christmas celebration with it last month and am looking forward to seeing how the camera did in available light indoors. Hi Jim, excellent post on the N90s!! I had one of these in the 90s, sold it, and have one now in one of my drawers. As you said, this camera is more capable than anything I could ever do with it. Great results! Thanks Sam! It’s very enjoyable to use and I can see that I’ll be putting this one into regular rotation. Excellent write up and photos Jim, just put a new film in mine but the weather has not been to kind here in the UK to get out and use it. I’ll mabe have ago at shooting indoors like you did. It’s a great camera to shoot indoors! I had one some years ago, too. No idea why I sold it anymore, but I liked the responsive autofocus, the bright finder, and the ability to use standard batteries. Yessssss – standard batteries! I love it when I can just drop AAs into a camera. The way I remember it the AF was quicker than my EOS 650. But I may be imagining that. I have an EOS 650; now I want to compare them. Beautiful images you’ve got here. Picked one of these up for $25 with the MF-26 back. I was expecting it to feel cheap, but the build quality is amazing. I’m extremely impressed. They’re absolutely made out of plastic, but they’re still fairly well screwed together. I sold mine last year, but I’m betting that if I pressed it into regular service I could have gotten 10 or 20 years out of it no problem. Did you develop these photos yourself? If so, can you share what chemicals and technique you used? They look great! I sent them out to a lab to be processed. I probably used Old School Photo Lab, oldschoolphotolab.com. Just got one of these cameras. Shot 2 rolls through it, and they looked great. Terrific camera build as well. Do you recommend the Matrix metering with just color, or will it be fine with black and white? Thanks. I don’t know enough about the pros and cons of matrix metering to say for sure. I use it all the time with every film in this camera and am never disappointed. Just came across an N90s at a thrift shop here in Huntsville. $20. Loaded some fresh batteries and away we went. Going to put a roll of film through it this weekend. I have an old 28-80(I think) lens on it. It makes a helluva noise while it is autofocusing. Might need to get something a little better. Right now is the time to buy up these auto-everything higher-end SLRs as they are dirt cheap. Eventually people will figure out how brilliant they are and prices will go up. I use a 50/1.8 on my N90s and I don’t recall the AF noise to be too bad. Have just found this review after skipping through a number of Internet searches. And three years late – that’s me. I have the N90X version (I live in the UK), along with a F601/F4/F5 – and all in the last year after 20+ years of digital photography. I adore my N90X. It has dinks. Its been well used (and that’s before I got it) – but its a joy to use. It is straight forward, and it follows the Nikon ethos (Hands up – I’m a Nikon-a-phile). I have to admit though, I was surprised how well it does work. The autofocus rarely struggles ( and isn’t too noisy). The metering is pretty accurate, and I kind of enjoy the why film photography “slows you down”. Sadly prices in the UK are on the way up – within a few months prices have doubled, if not more. Particularly on eBay. But if you look hard enough, the bargains are still out there. Yup! On all counts. The N90s/F90x is just crackerjack. Sad to hear prices are on the way up.